What happens when you lose one of your passions? Jaleel Grandberry ’19 was haunted by that question when he thought about his senior year, knowing it meant he would be at the end of his football-playing career. But then Grandberry had “the best summer of his life” in Los Angeles. “I discovered w orking in sports,” he said. Grandberry worked as a production intern with the NFL Network. 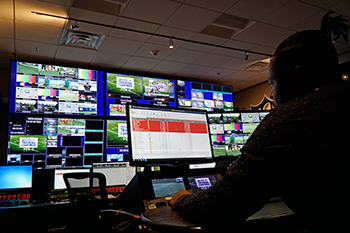 He wrote interviews and scripts, created video content, pitched new segments, and scanned social media for NFL players’ posts. “I thought that at an organization like the NFL Network that I’d be in the background watching, but they really threw us in there and let us get a good grasp on things,” he said. Grandberry worked mostly with the network’s show “NFL Total Access,” a show he had watched for years. One of Grandberry’s tasks was to work on “bumps” for the show, short clips previewing what would follow a commercial break. As a rhetoric major and a creative writing minor, he said he felt a lot of pressure to be good and had to erase and start over quite often. But then he would see his work on television. 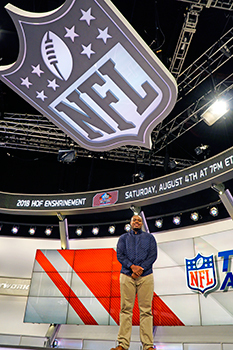 During his time at the NFL Network, Grandberry met several former and current football players including Michael Irvin, Eric Dickerson, Terrell Davis, LaDainian Tomlinson, and Jalen Ramsey. In meetings, it was all he could do to be professional and not think about the fact that he used to have posters of some of them on his wall. And that hasn’t gotten any easier this semester, as he’s now working as a Game Day Intern with the Indianapolis Colts. “I got to meet my favorite player, Ruben Foster, an inside linebacker for the San Francisco 49ers,” he said. “Before the game, I decided to go down to the field and watch the guys stretch. As I’m walking to the field from the elevator, he’s coming out of the visiting locker room, and we walked to the tunnel together. Grandberry can often be found in the press box before Colts home games. Once the game starts, the interns can either watch from the press box or go down to the field. During the second preseason game, Grandberry was asked to find a family in the nosebleeds and give them field passes for halftime. After the game, he goes down to the locker rooms and/or the press conference room to record interviews, and then he’ll transcribe them. “It’s cool to be in the locker rooms because your arm might be one of the ones that makes the news later,” he laughs. Even though these experiences have been amazing opportunities, Grandberry pointed out that they’ve been opportunities that he’s built. Grandberry’s Senior Day is Saturday at Hollett Little Giant Stadium, but it doesn’t feel like a huge part of his life is completely ending anymore. “I’ll still be around the game,” he said. “I’m very passionate about football, and I think I can transfer my love from playing to working in it.